Before starting this article, it's important that you, the reader, know a few basic things about the island, if you don't already. First, it wasn't always pummeled by an endless storm; there was a time when users with access to an application for cell phones called "Neopets Mobile" could visit and explore the island. Second, Lutari Island is where Lutaris originally came from (and the only place they could be adopted for a long time, too). Third, this service is now discontinued and no one can fully access the island anymore. We at The Neopian Times decided to investigate the island and some of its history. We hope you enjoy and find all this information useful! 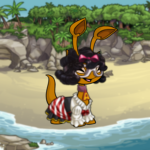 Like pretty much everything that relates to Lutari Island, the number of native petpets has yet to be studied. Are Lutaris the only creatures living on the island? Or are there hundreds of petpets living with them? No one can say. Besides the fully-grown Lutaris, the only native creatures confirmed to live on the island are the Floobix – small and exotic birds with colorful feathers – and the Weebly. Unfortunately, they are extremely and increasingly rare nowadays. One hasn't been seen in ages, which could probably mean they aren't living outside the island anymore. Although rare, some strange plushies from Lutari Island are still in circulation. However, unlike most plushies, which were manufactured in the Plushie Palace, these weren't built inside Neopia Central; instead, they were brought directly from the island, back when users could visit and explore it! Why are these plushies featuring a Kacheek, a Tonu and a Grundo? Did these species inhabit the island before and we didn't know about it? Did Lutaris know about our existence before we discovered the island? The mystery never stops! The items in the images are called Lutari Kacheek Plushie, Lutari Tonu Plushie, and Lutari Grundo Plushie respectively. Sadly, of the three plushies, only the last one is cheap enough to be bought using the shop wizard. Currently there are three known foods that originate from the island – the Lutari Cocojuice, the Lutari Mango (best known as Lutango), and the Lutari Rainbow Cone. Biologists assume the island's inhabitants have farmed a few species of plants so they could harvest the first two foods. As for the third food, it's believed that the Lutaris living on the island have developed an ice-cream industry using organic ingredients provided by the island's flora, as these were a huge success amongst tourists. Nothing to worry about, though; thanks to preservation techniques from the modern world, you can still experience these tropical food and buy them in a variety of user shops. The Lutari Cocojuice is available for roughly 2,000 NP; the Lutango for 2,500 NP; and the Rainbow Lutari Cone for approximately 5,000 NP. The colorful items you see on the images are the Lutari Feathered Bed, the Lutari Feathered Dresser and the Lutari Feathered Chair, respectively, all original from Lutari Island and built entirely using its materials. The dresser and the chair were brought in great amounts from tourists when the island was accessible, but, unfortunately, the Lutari bed has never left the island. It's also worth noting that, besides these two, the only Lutari furniture that's available for purchase is the Lutari Island Room in a Bag pack, which is available in the NC Mall and features a Lutari Island Nest Bed, a Lutari Island Sofa, a Lutari Island Tree Desk, a Wooden Lutari Island Lamp, the Feather Lutari Island Wallpaper and some Stone Lutari Island Floor Tiles. Lutari Island Fences and a Lutari Island Gazebo were also available in the past, but those items are currently retired. Just like any land is interested in selling their products and promoting more tourism, Lutari Island was no exception, and it too had a few items Neopets could bring home if they went to a souvenir shop, or participated in some of the community's activities. If you ever see a Tribal Makeup Set or a Lutari Feather for sale, now you know where they came from! Although Lutaris are very friendly creatures, and would rather swim or play with their owners than battle other pets, they too have weapons developed especially for them. Currently there are many weapons and armours for this species, but only the Lutari Battle Helmet, the Lutari Battle Sword and the Lutari Battle Torch are directly from the island. There is also a book called Lutari Battle Strategies, which is the only Lutari Island book. There is one strange artifact brought from some island visitors, back when the island wasn't being attacked by its storm. The Lutari Paint Brush, however, doesn't seem to be compatible with any species of Neopet yet, meaning it cannot paint any creature at the moment. 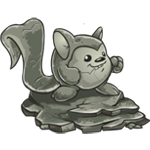 It is unknown whether or not this item has any use inside the island or if the Rainbow Pool will ever recognise it as a color for Neopets. Despite this, however, it still is a great collectible item, which any gallery would benefit from! Also, there is the possibility of receiving this paint brush in the Alien Vending Machine, if it happens to be without food by the time you spend your nerkmid. I'm sure all readers are familiar with this artifact. The Lutari Talisman is a Neopets trophy given to all accounts upon their creation, which grants its proprietor moments of luck while browsing the site and playing games. When conveniently used, it will grant bigger neopoint rewards at flash games (up to 2x), discounts at the main shops (up to 10%) and, although not entirely proved, even random events and faerie quests more frequently! However, to take full advantage of the talisman, one had to collect special beads from Lutari Island and attach them to the artifact, activating its effects and good luck. These beads come in four different colors – blue, green, red and yellow – and five unique shapes – matu, oranu, ranaka, tongi and urapa. Any green bead will contribute to more neopoints in flash games, while the red beads will be responsible for the discounts at the main shops (not the users shops). These beads are very unique, and only Lutari Island's geological proprieties meet the requirements for the creation of these minerals, hence being very rare. Currently there are two stamps from Lutari Island in circulation – the Happy Lutari Stamp and the Lutari Uni Stamp – but it's possible that these aren't the only ones made by the natives. In fact, there might be a lot more stamps we've never seen featuring Lutari creatures and places! If you decide to acquire them and put them in your album, they will be placed in the "Other" set of your collection. There is a lot to talk about this mysterious place, but unfortunately many documents have been lost, and some of the items are just too rare! We hope you enjoyed this article nevertheless, and found all this information interesting. Whether the talisman piqued your interest or the food made you curious, there is something for everyone on the island.